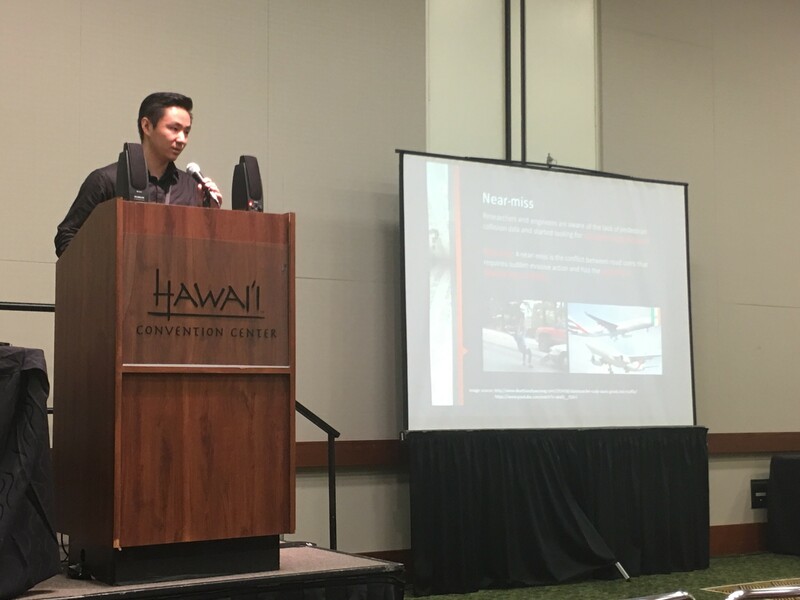 This past July, PacTrans Student Researcher, Ruimin Ke (UW), traveled to Honolulu, Hawaii, to participate in the IEEE Conference on Computer Vision and Pattern Recognition (CVPR) Traffic Surveillance and Challenge Workshop. The IEEE CVPR Conference is among the most prominent conference focused on computing. Mr. Ke attended to present research titled, A Cost-Effective Framework for Automated Vehicle-Pedestrian Near-Miss Detection through Onboard Monocular Vision. This presentation is part of an ongoing effort between the University of Washington, PacTrans, and the Washington State Transit Insurance Pool, funded partially through a TRB IDEA grant, to test collision detection technology on transit buses in the Pacific Northwest. Pedestrian safety has generated broader concerns as the number of pedestrian-related fatalities keeps increasing in terms of the percentage to total fatalities. This is partly due to the lack of pedestrian data for conducting solid studies. Thus, near-miss, as a surrogate safety measure, has become popular in pedestrian safety. But extracting near-miss data from the huge amount of different resources requires efficient and automated methods. Computer vision techniques are powerful and able to take the information-rich traffic images and videos as input data. The study I presented at CVPR 2017 was about extracting vehicle-pedestrian near-misses from onboard monocular video data. This is among the first efforts to extract vehicle-pedestrian conflicts using onboard monocular vision. The framework we proposed is cost-effective. The experimental results showed that the proposed system is comparable to a commercial system with multiple camera sensors in terms of accuracy.